Met up w the best friend for a much needed dim sum brunch. First dim sum meal in 5 months! The steady stream of customers became a crowd by the time we left. Clearly the nondescript location is not an issue to foodies who love to eat. Fortunately for me what they are famous for are the stuff that I usually order for dim sum. 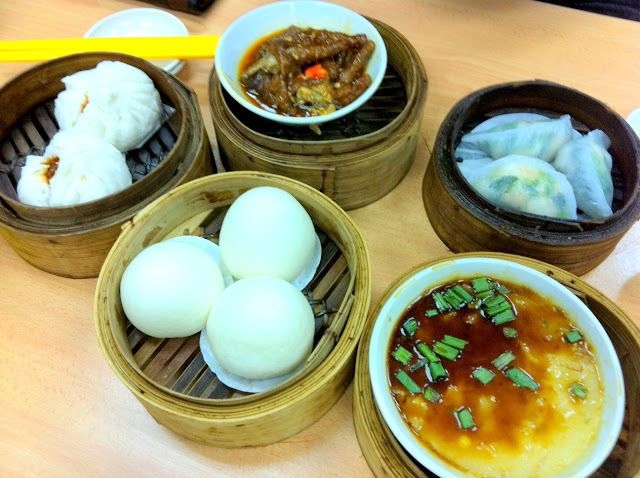 We shared their liu sha bao, char siew bao, milk tea (HK style), and XO carrot cake. The friend insisted on having her chicken claws (which are euphemistically called phoenix claws aha) and shrimp & spinach dumplings and she finished everything! I took ownership of the steamed egg white with almond. The friend notoriously hates egg whites but I did manage to trick her into taking a spoonful. While she cringed at the ‘protein taste’, she did agree the texture was good heh. Furiously whatsapped the other best friend who is on exchange in the states 😛 She was craving lsbs, and the photos caused her be very envious. The best friend insisted that the chicken claws were really awesome. More cuz of the fiery kick of chilli, according to her. Char siew bao could have been more moist inside (Royal China!!!) but still, it satiated my craving. Likewise, I can think of moister and softer steamed carrot cakes (Crystal Jade and Imperial Treasure) but this was really not too bad and very generous in portion. Two thumbs up for the plump lsbs that made it to the table. I still like Taste paradise’s lsbs which are smaller, but the pao skin softer, and the filling way less oily (I could drain out a bit of oil before eating this one!). That said, we were really satisfied peeling apart these delicious paos apart and getting our fingers dirty. yummmm.